Wildfires have consumed over 170,000 acres in California since Sunday and thousands have taken refuge in shelters as their homes have burned. But for the United States Postal Service, the deliveries must go on. 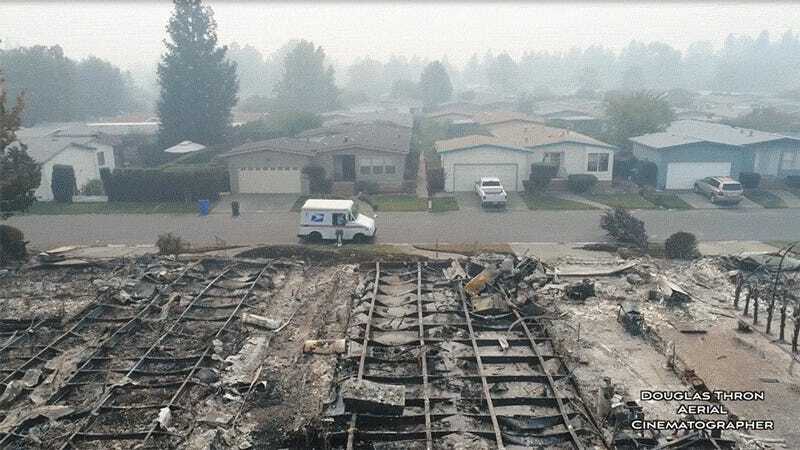 In a devastated neighborhood in Santa Rosa, a professional drone cinematographer caught this astonishing footage of one mail carrier’s surreal shift. I know the “motto” that’s going through your head right now: “Neither snow nor rain nor heat nor gloom of night stays these couriers from the swift completion of their appointed rounds.” But as NPR points out, the USPS doesn’t have an official motto, those words are just a quote from the Greek historian Herodotus that is inscribed on the facade of the New York City Post Office on 8th Avenue. The fact that people associate the quote with the Post Office is a badge of honor for the institution. This is an example of the long standing relationship that has been established between our carriers and their customers based on trust. The carrier in question was honoring a request by a few customers who were being let back in the fire zone to retrieve personal items. A few customers asked the carrier to leave their mail if the mailbox was still standing because they could not get to the annex to retrieve it. According to The Washington Post, the death toll in the region has climbed to 23, and 285 people are still missing after the fires destroyed 3,500 businesses and homes. Authorities have blamed a combination of hurricane strength winds, renewed vegetation following a rainy Spring, and a subsequent drought that turned that vegetation into kindling over the course of the summer. It’s still unknown what initially sparked the fires. It’s a small comfort for victims who’ve lost their homes, but at least they know where they can find their mail.